Rakhi festival is a high time to express the feelings of your heart to your siblings. 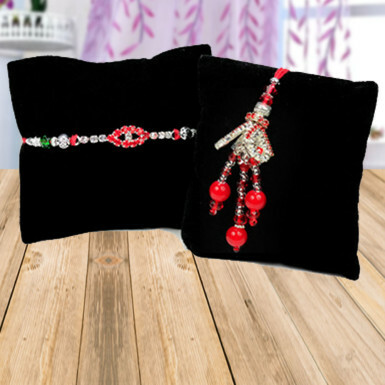 This rakhi festival, adore your bhaiya-bhabhi by presenting this wonderful rakhi set to them. It’s a beautiful set of 2 rakhi which epitomizes the love and protection. The lumba rakhi will glorify the bangles of your bhabhi . So, go ahead and place your order for this rakhi set now!